We always order the same thing… always. I think it’s because we’re usually there when it’s just the two of us, and we know how much we can reasonably eat. I’m sure if we went with a group of people, we’d explore more of the menu. 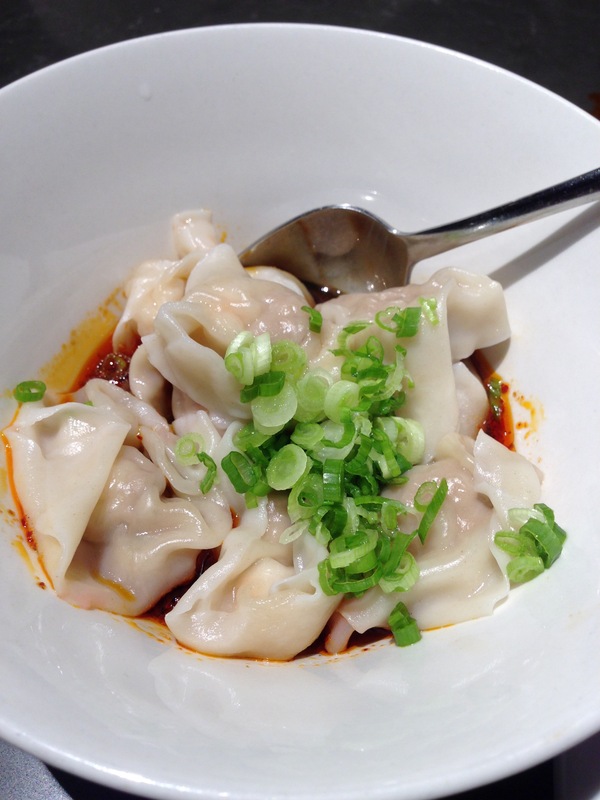 We always get the cucumber salad, an order of pork XLB, and an order of the pork wontons in spicy sauce. Lately, we get 2 orders of the wontons in spicy sauce so we don’t have to share. Whatever magical combination of oil, spices, and sugar goes into that sauce has me hooked. I’ve tried reverse engineering it, but I just can’t get it right. I’ve also been searching all over San Diego to find the right combination of wontons and spicy sauce, but so far I’ve been unsuccessful. Sometimes we get the green beans (also garlicky, always perfectly cooked) or the potstickers (with all the crispy edges and borders). 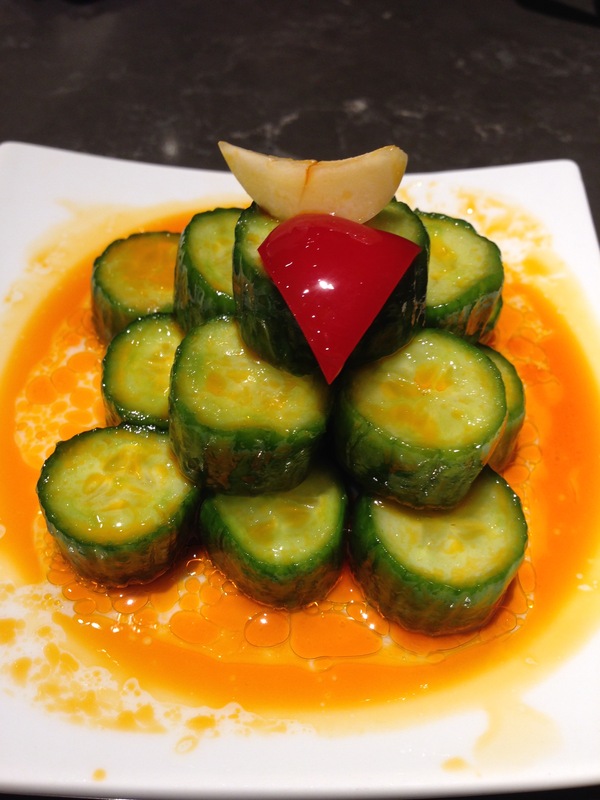 The cucumbers are always cool and crisp, with a nice punch of garlic and chili oil. This I can recreate at home, and often do when we have cucumbers in the fridge and I want a snack more exciting than hummus. 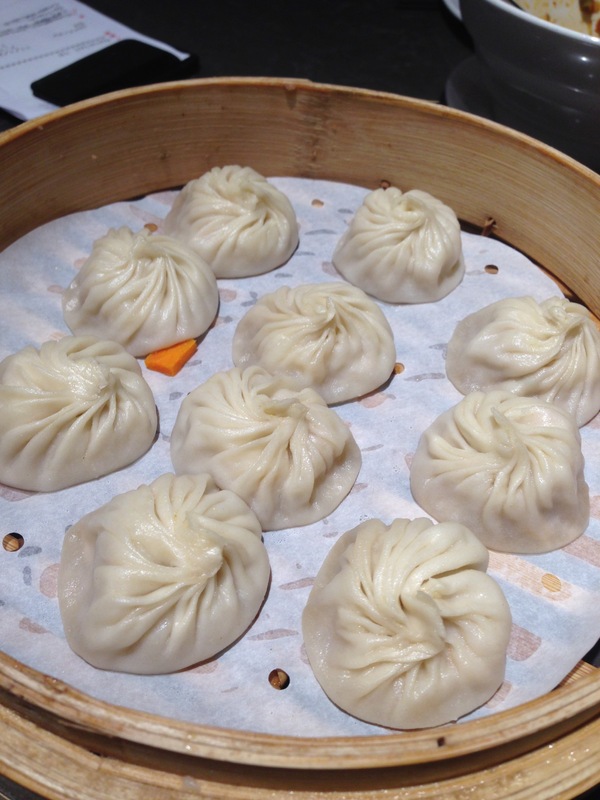 I am, in no way, an expert in XLB (I admit to visiting Dumpling Inn for a quick fix and being perfectly happy) and these make me happy every time. The dumplings come out quickly, they’re always hot, and they’re always full of soup. Thanks to Kirbie, I now have a vinegar/soy ratio to aim for as a dipping sauce. I do wish the Costa Mesa location would let you call in an order to go. It would be so convenient to be able to just swing by and take some wontons and spicy sauce home instead of gambling on the wait time for a table (on one visit, the wait time went from 30 minutes to 2 hours, somehow, in the 30 minutes between my calling them and us arriving at South Coast Plaza). If we get there early enough, we’ll often just wait for a bar spot to open up instead of waiting for hours on end. 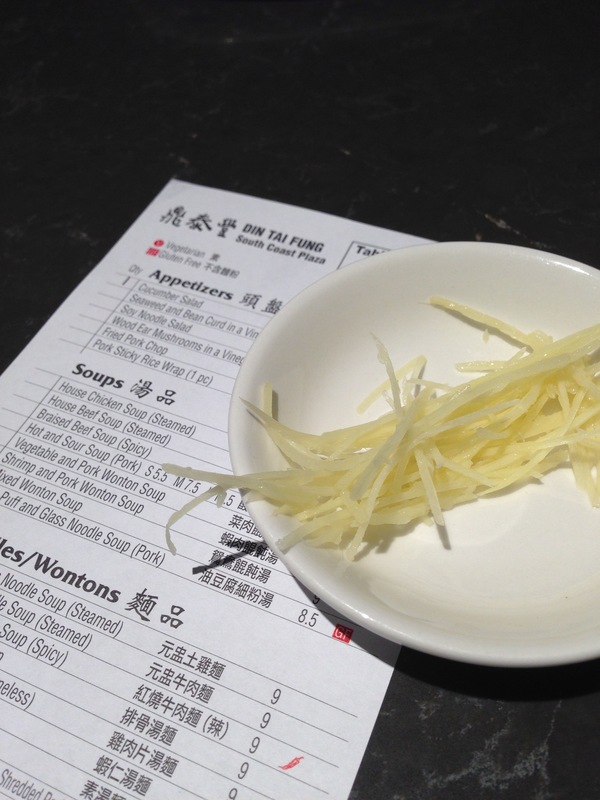 What we learned on a previous visit was that you can get 2 orders of wontons to go. But, I think it depends on your server and possibly even the manager on duty that day. Our last visit, our server said there wasn’t a limit to how much we could order to go at the end of our meal, but we didn’t want to push things so we just got our 2 orders of wontons in spicy sauce to take home. I like it because it’s all packaged separately, and there’s always plenty of sauce so I’ll steam additional wontons when we get home to stretch it all out. 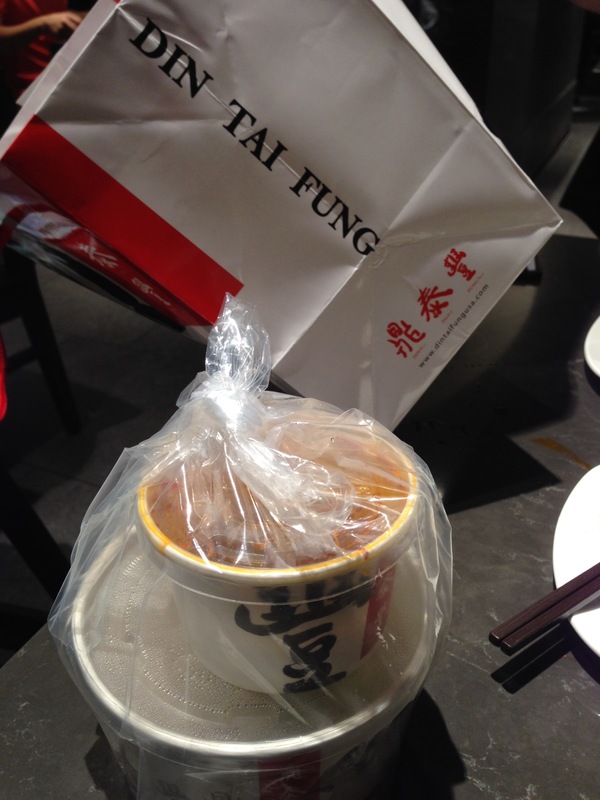 This entry was posted in food, restaurants and tagged costa mesa, din tai fung, dumplings, xlb. Bookmark the permalink. The dumplings come in the bowl on top of the sauce, and then you mix it all up (or, at least, we do) and it’s delicious. I’m seriously addicted to that dish. I hate long lines, too! If there’s a bar spot at Costa Mesa, that’s easy to snag. I’ve also eaten at the communal table (if there’s just a couple of you) at the original Arcadia location as a way to skip the line. And I’ve definitely found that if you go during non-peak meal times the wait is really minimal. While in Seattle, I went to the Bellevue location and had a 2 hour wait on a Saturday night. But like South Coast Plaza, you could shop nearby prior to getting the text that your table is (almost) ready. Then I was near the University Village location, so of course I had to go to DTF as well! Wonder how Seattle rates two locations?